Knocklayd looms large over Ballycastle on the northern Antrim coast; the last substantial hill before the sea. It is one of the more striking summits in the area, a steep-sided dome rising in reasonable isolation from its neighbours. 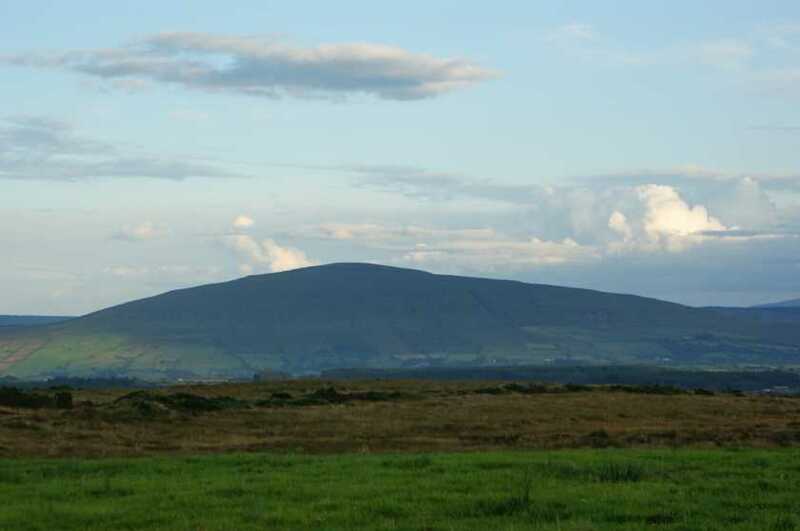 Apart from some forestry on the north and east sides, it is a hill without a hint of mystery, devoid as it is of significant watercourses; everything on Knocklayd is in plain view from the surrounding countryside. Its location and relative isolation make it a fine vantage point. A quick route to the summit can be had from a car park in Ballycastle Forest Park on the eastern slopes at (131377 A). Keeping left at a couple of junctions leads to a forest path leading bullet straight up the hillside, broadening into a rough track. Once through a gate at the edge of the forest (a longer route from Ballycastle itself comes in from the north here) incline up left to join a fence that leads straight up to the summit area, crossing two traversing fences high up; the ascent is steep in its middle reaches but eases off onto the rounded summit. A round trip by this route will take roughly 90 minutes.